It looks like Glenn Beck should have saved his ire for the Archie comics rather than losing it over the new biracial, gay Spider-Man (particularly because Miles Morales is heterosexual). 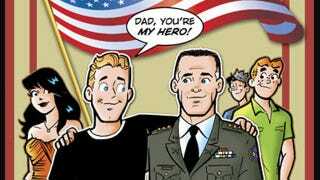 It was announced today that Archie's friend Kevin Keller will get married to a man later this year. Conservatives are extremely upset because if there's one thing that influences today's kids, it's Archie comics. Like the new Spider-Man, Kevin exists in an alternate universe, which features stories about the possible future of Archie and company. He was introduced last year, and according to a press release, "Kevin followed in his father's footsteps and is returning to Riverdale as a war hero, but that's not all – It's Kevin's wedding day!" "It's unfortunate that a comic book series usually seen as depicting innocent, all-American life is now being used to advance the sexual revolution. I think whatever boost in sales might come from the novelty or curiosity factors will be more than offset by the number of both kids and parents who will be turned off by this storyline and its obvious social and political agenda. With this comic book coming out (no pun intended) and Chaz Bono dancing with stars, it's only a matter of time before every child out there is a gay married transsexual. Because, as all science will tell you, children merely have to set eyes on LGBT people and they instantly turn into one themselves. It's like the alternate lifestyle version of Medusa and stone.